If you've seen Lilo and Stitch, you know that "Ohana" (family) is big-time important in Hawaii. So it's no surprise that even luxury Waikiki properties are family-friendly. Generally, kids up to age 18 stay free in parents' rooms. All the properties below are just a short walk from surf lessons, Atlantis Submarine, and numerous eateries and shops. About those surf lessons... Waikiki Beach is a great chance to try the waves. Conditions typically suit beginners, and even kids as young as seven can try. 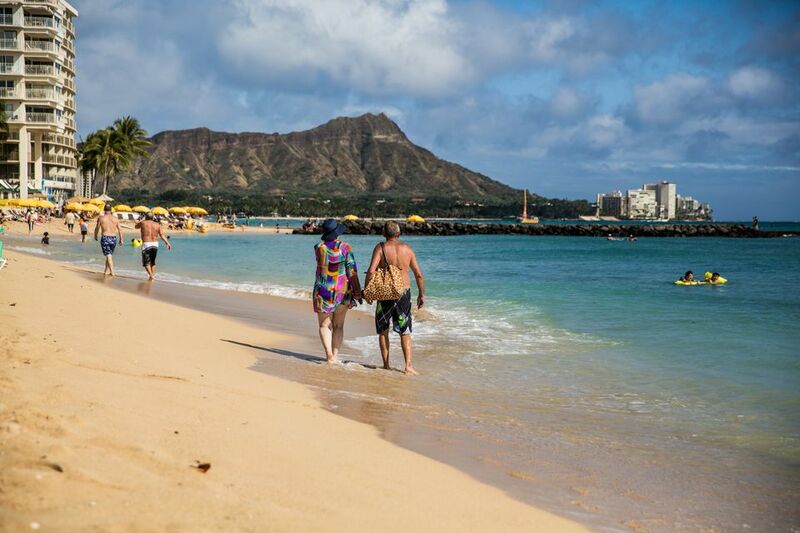 The most resort-like of the properties on Waikiki Beach, Hilton Hawaiian Village Beach Resort & Spa rests at the far west (quieter) end of the beach, with 22 acres, pools, a kids' club, fish ponds, flamingos, hula classes, a spa, restaurants, shopping village, and more. Outrigger has several properties in Hawaii. The flagship property is the Outrigger Reef, right on Waikiki Beach. Catamaran outings depart right from the shore. On-site activities include crafts and hula performances, lei-making, and a kids program. Note that Outrigger has a sister family of resorts called OHANA (which means family): both brands are family-friendly; the OHANA hotels have a lower price point and are not beach-side. This landmark right on Waikiki Beach opened in 1927 in a spot that had been a playground of Hawaiian royalty and has been dubbed the "Pink Palace of the Pacific." The other landmark hotel on Waikiki Beach has a nickname too: "The First Lady of Waikiki". Now branded as a Westin resort (with Kids Discovery Club), the original hotel opened in 1901 as the first beachfront resort on Waikiki Beach. Even if you don't stay here, walk along the beach and peek at its gigantic banyan tree, framed by a colonial-style verandah: planted in 1904, the tree is 75' high, 150' wide. The resort has free historical tours. * Always check resort websites for updates.